Every week, I walked with my mother 20 kilometers to the market, to sell vegetables. This was as far as I went, and as much as I saw of the world beyond my village. I dreamed of travel. I dreamed of seeing other cities, other countries. I wondered what they were like. Since then, I have traveled a great deal. I have seen more of the world than I ever imagined. But nothing has broadened my vision as much as the perspective I have gained through Rotary. Before I was a Rotarian, I saw only what was in front of me. I saw my business, my family, my customers, and my competitors. When I traveled, I saw only what I knew to look at. But I did not see beyond that. I did not look for context. I did not look past what I believed was relevant to me. One day, I was asked to join the Rotary Club of Yashio. And it was two years later that someone came and spoke to us about the idea of vocational service. From that day, slowly, I began to change. I realized that the purpose of my life was not just to earn more, to sell more, to make my business better than anyone else’s. I realized that I wanted to have better goals and higher goals — both personally and professionally. I realized that for me, the most important thing in life was being useful to other people. And I realized that by helping others, even in the simplest of ways, I could help to build peace. We hear the word peace every day. We hear it in the news, we use it in conversation, and we talk about it a great deal in Rotary. But most of us spend very little time thinking about what peace is, and what that word means. On its simplest level, peace can be defined by what it is not. It is a state of no war, no violence, and no fear. It means that you are not in danger of hunger or persecution or the suffering of poverty. But we can also define peace by what it is, and by what it can be. Peace can mean freedom of thought and of speech, freedom of opinion and of choice, and the ability for self-determination. It can mean security, confidence in the future: a life and home in a stable society. On a more abstract level, peace can mean a sense of happiness, of inner serenity, of calm. The truth is that peace means different things to different people. No definition is right, and no definition is wrong. However we use the word, this is what peace means for us. And however we use the word, however we understand peace, Rotary can help us to achieve it. Rotary helps us to meet the basic needs of others: to provide health care, sanitation, food, and education when and where it is most needed. It helps to meet the inner needs as well, for friendship, connection, and caring. And Rotary helps us to build peace in its most traditional sense, by reducing the causes of conflict. It builds bridges of friendship and tolerance among people and nations. It helps us to understand each other. Through our service, we learn that the problems that may seem large to us are really very small. We learn empathy for others. We come closer to people who seem very different from us. And we begin to understand how alike we really are. Through our Rotary service, we learn that cooperation is more productive than conflict. We learn to value each other, as human beings with human strengths and weaknesses. We learn that every one of us has something to give, and every one has something to teach. To me, Service Above Self is more than just a motto. It is a way of life — one that will make any life richer and more meaningful. Putting Service Above Self allows us to focus our energies on what is truly important. We put the common good above our own. We prioritize others’ needs over our own desires. We think less about ourselves and more about what is best for everyone. And in this way, we help to build the foundation for a more peaceful world. 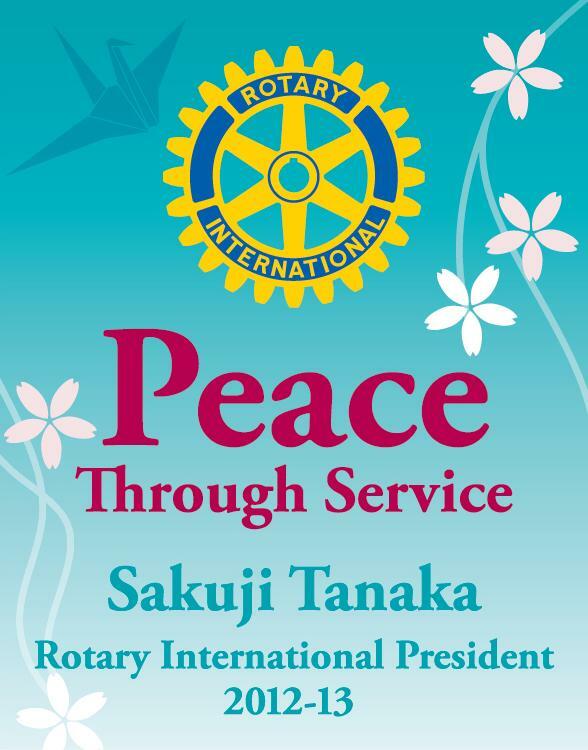 This is why, in 2012-13, our Rotary theme will be Peace Through Service. Because however we define peace, whatever peace means to us, we can bring it closer through service. Service Above Self reminds us that none of us can live for ourselves alone. A life lived in isolation is empty and without joy. But when we live for others — when we focus on our role within our family, our community, and all humanity — then we begin to realize our own place in the world. I am part of the first generation to grow up in Japan after a terrible war. I think it is natural that we now place a great priority on peace. We saw where militarism brought our country. And we also saw the great economic growth that came when our nation made the choice to change our way of thinking, and to embrace peace. This was the decision that allowed Japan to grow and thrive. It allowed new generations of children to grow up in safety, to become educated, to improve their lives. It fundamentally changed the Japanese attitude toward other countries and cultures. It caused us to open our minds, to become more tolerant, to seek greater understanding. And it allowed us to redirect our energies toward positive goals. 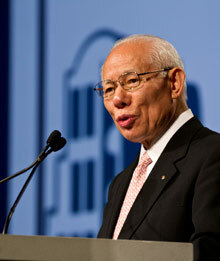 In Japan, it is traditional to prioritize the needs of the society over the needs of the individual. This has always been part of our culture. In the weeks and months following the great earthquake and disaster of last March, this was what helped us to survive and rebuild. This is a lesson that I think the whole world can learn from, in a positive way. When we see the needs of others as more important than our own needs — when we focus our energies on a shared goal that is for the good of all — this changes everything. It changes our perceptions. It changes how we relate to the world. It changes our priorities in a completely fundamental way. And it changes how we understand the idea of peace. For me, the idea of Peace Through Service does not involve any complicated philosophy. I am not a philosopher. I am a salesman. And over many years of business, I have learned that ultimately, the only way to a successful business is happy customers. When my customers are happy, my business grows. And this makes me happy in turn — not only because my business is doing well, but because I am glad to see that I have made others happy. In business and in life, in order to get where you want, you have to know where you are going. In Rotary, we have made the decision to adopt the goals and priorities of the RI Strategic Plan as the roadmap for our organization. And so, in 2012-13, I will ask you to focus the energies of your clubs on the three priorities of the RI Strategic Plan: to support and strengthen clubs, to focus and increase humanitarian service, and to enhance public image and awareness. I will ask you also to help promote the three Rotary global peace forums that we will be holding in Hiroshima, Berlin, and Honolulu. You will be learning more about these important events during this assembly. I hope that many of you will become involved and make it a priority to attend. In Rotary, our business is not profit. Our business is peace. Our reward is not money, but the happiness and satisfaction of seeing a better, more peaceful world — one that we have achieved through our own efforts. In this Rotary year, I ask you to put Peace Through Service at the forefront of your Rotary work. And I ask you to understand that peace, in all of the ways that we can understand it, is a real goal and a realistic goal for Rotary. Peace is not something that can only be achieved through treaties, by governments, or through heroic struggles. It is something that we can find and that we can achieve, every day and in many simple ways. And so I ask you all to commit to a Rotary year of Peace Through Service — and a Rotary goal of a more peaceful world.